Disclosure: I was provided samples by Colgate/Palmolive to facilitate my review. All opinions are strictly my own. Colgate is shaking things up with the latest addition to the Colgate Total portfolio - new Colgate Total Advanced Heath Mouthwash. Building on the dual phase trend seen in many health and beauty products, this mouthwash is the first oral care product to contain two-layer technology; combining freshening power with germ killing ingredients (cetylpyridinium chloride (CPC)). First shake the bottle to activate, next clean to remove 24x more bacteria* and then you will see the results in the sink! Simply - Shake, Clean , see - for a healthier mouth! The new Colgate Total Advanced Heath Mouthwash not only removes bacteria, but freshens breath, reduces plaque and helps to prevent gingivitis. The Colgate Total Advanced Heath Mouthwash ranges in size from 200mL - 800mL and $4.99 - $7.99 a bottle. 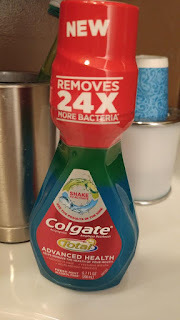 I am always excited to try new oral care products and was excited to try Colgate Total Advanced Heath Mouthwash! The flavor is a little stronger than I was expecting, but like with all mouthwashes, it does take some time to get used to a new flavor/brand! I was not at all disappointed with this rinse, it has kept my breath fresh and my mouth feeling clean for hours!